Symmetry Activity: Have students examine a number of objects in the classroom, both two-dimensional and three-dimensional, to determine how many lines or planes of symmetry can be found in each. Symmetry Activity: Take the students on a field trip in the schoolyard to look for patterns in other objects in nature. Have them draw simple pictures of objects they find in nature, and use those drawings to help examine the symmetry of the objects. Help the students begin to understand that the angle at which they make their drawing affects the presence of symmetry. Painters often alter the angle of three-dimensional symmetrical objects to make them appear asymmetrical in two-dimensional drawings, to add interest to the paintings. Snowflake Symmetry Activity: Have students examine the symmetry of snowflakes by viewing photographs. The Bentley Snow Crystal Collection of the Buffalo Museum of Science, available online, is an excellent place to begin. Wilson A. Bentley, nick-named “Snowflake Bentley,” spent his life taking photographs of snowflakes. You can find more online photos at the SnowCrystals.com Snow Crystal Photo Gallery. The students should be able to figure out that, while most snowflakes have rotational symmetry, they do not all have the same number of lines of symmetry. Also, snowflakes sometimes have reflection symmetry (only 1 line of symmetry). And sometimes snowflakes are asymmetrical. Bentley’s photographs include information about the weather conditions for each snowflake. 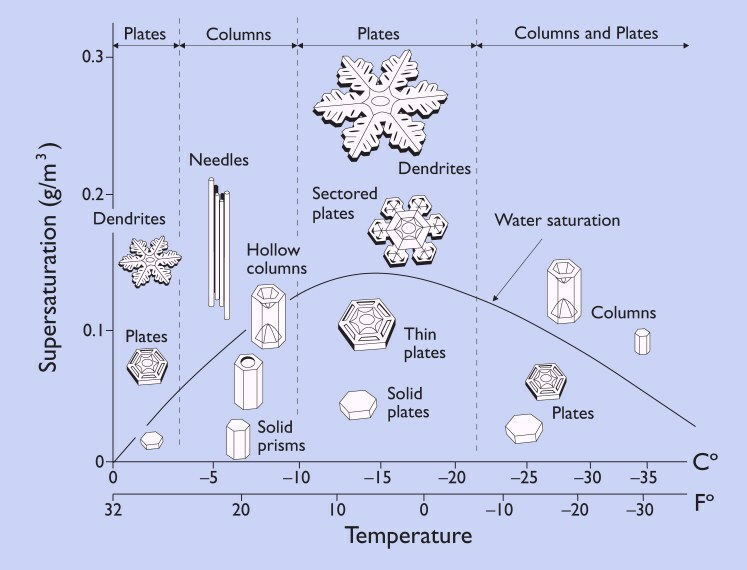 Have the students study the weather conditions for various snowflakes to determine if weather conditions affect the number of lines of symmetry of snowflakes. Some answers can be found online at the SnowCrystals.com Guide to Snowflakes. Snowflake Morphology Activity: Have students read the information that explains The Snow Morphology Diagram from the SnowCrystals.com Snowflake Primer. On the diagram, “Supersaturation” refers to humidity. Low supersaturation numbers indicate low humidity. Have students obtain data (air temperature, humidity, and shapes of snowflakes) each time it snows throughout the winter. Have them use this data to create a graph similar to that found in the Morphology Diagram. Have the students see if their weather data enables them to predict the shapes/types of snowflakes. You can download the Snow Morphology Diagram directly by clicking here. Additional Snowflake Activities: For additional activities on snowflakes, see other activities at SnowCrystals.com. In particular, look at Grow Your Own Snow Crystals. Snow Crystal Lesson: Why Do Snowflakes Come in So Many Shapes and Sizes? Lesson Plan: From TeachersDomain.org, in this in-depth lesson, students build an apparatus that creates conditions similar to a winter cloud and produce their own snow crystals indoors. By watching the snow crystals grow, they learn about the molecular forces that shape ice crystals, and gain a deeper understanding of the states of matter. By exploring media resources, including microphotographs of real snowflakes, students also learn about molecular forces, the particulate nature of matter, and condensation. Albedo Lesson: Earth’s Albedo and Global Warming: From TeachersDomain.org, this interactive activity adapted from NASA and the U.S. Geological Survey illustrates the concept of albedo—the measure of how much solar radiation is reflected from Earth’s surface. Arctic Climate Modeling Program Curriculum Resources: Includes lessons on observing and forecasting, weather basics, and climate systems.